The Green Climate Fund (GCF) was conceived at the Copenhagen COP in 2009 as the main multilateral financing mechanism to support climate change actions in developing countries. This 2012 discussion paper was prepared for the Regional Clinic on the Design and Management of National Climate Funds (NCFs) on 6-8 September 2012 in Bangkok, Thailand. Its objective is to situate the discussion on NCFs in the context of the evolving landscape of international climate finance. Since many NCFs are expected to play an instrumental role in accessing international funds for national climate change projects and programs, it is essential that managers of NCFs understand the requirements for accessing the funds using the direct access modality. The paper provides historical context for the establishment of the GCF and discusses key design considerations drawn from public documents from the GCF website, briefing notes, and background discussions on design issues considered by members of the Transitional Committee (TC) for the design of the GCF. The paper concludes by outlining key considerations which should be taken into account in the design and operation of NCFs to enhance their readiness to directly access international climate finance. Past Experience in Direct Access to International Climate Finance: Overview of Challenges and Indications for Future Requirements - this section reviews past experience of developing countries in directly accessing international climate funds. The focus is on understanding current requirements of the funds against which developing country institutions must be accredited before gaining direct access. Evolving Architecture of Direct Access to International Climate Finance: Considerations for National Climate Funds - This section discusses key considerations for NCFs in the context of the evolving architecture of direct access to climate finance. It outlines steps which may be taken by NCFs not only in expectation of the GCF but also in enhancing national climate finance readiness more broadly. Many countries in the Asia-Pacific region have recently established National Climate Funds (NCFs) as an implementation tool to manage climate finance. Below is a summary of the recommendated considerations for NCFs attempting to access international climate finance. For more detail see the full text from page 13. First, designers of NCFs should pay close attention to the standards and safeguards which donors see as prerequisites for enabling access to their funds. Accountability mechanisms, stakeholder input and participation, and monitoring and evaluation are also likely to be fundamental to the national implementing entity (NIE) accreditation criteria and project approval process of the GCF. Experience from the Adaptation Fund and the GEF illustrates the importance of a strong track record of performance. NCFs hoping to serve as NIEs or the equivalent for major international climate funds will need to continue to invest in building fiduciary and safeguard systems and developing an inventory of evidence of their effectiveness. International climate funds are likely to prioritize funding for projects and programs which are mainstreamed into national development plans and processes. If a country expects its NCF to be the primary mechanism to access international climate finance and subsequently blend the funding with other domestic resources, then care is needed to ensure that the design of the NCF does not inadvertently work at cross-purpose to mainstreaming climate finance into national and subnational planning and budgeting systems. Such mainstreaming is especially important for climate change adaptation. To ensure mainstreaming, clear plans should be formulated to transition from the off-budget NCF to an on-budget mechanism at some future date. A sufficient volume of high quality project proposals is another key factor for a country’s ability to rapidly access international climate funds. In the case of the GEF, applicants for direct access already need to submit preliminary project ideas during the screening stage. It is in the interest of developing countries to raise the level of their NAMAs, NAPs and other climate change programs so that there is an available pipeline of high quality mitigation and adaptation projects. NCFs can play an important role by selecting the best projects for funding. To do so, NCFs need to develop capacity to review project proposals in order to prioritize the most promising projects to match the available sources of funding. Finally, it is important that NCFs have a strong monitoring and evaluation (M&E) plan and the means to implement it. Donors have increasingly placed emphasis on M&E in the provision of development finance in general, and for climate finance, and this is clearly reflected in the GCF’s Governing instrument. Looking forward, NCFs should invest resources in developing an M&E system for both mitigation and adaptation activities. The M&E system development could be carried out in an integrated manner with the strengthening of NCFs’ project review capacity, with the criteria used in prioritization of project proposals for funding feeding back into the M&E process and vice versa. Several donor and multilateral organizations are currently active in providing technical assistance to developing country national climate finance institutions NCFs could benefit substantially from familiarizing themselves with these capacity building programs and tap into their resources and expertise. 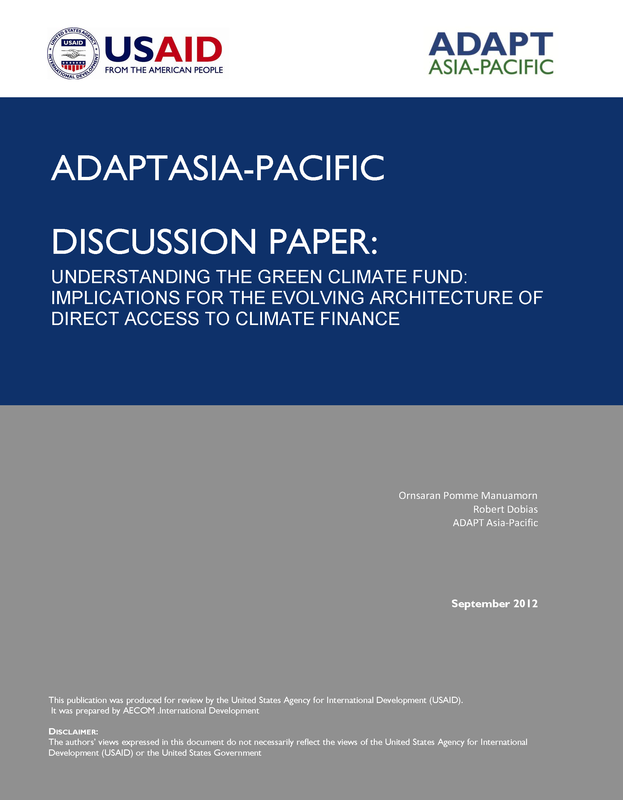 USAID Adapt Asia-Pacific (2012) Understanding the Green Climate Fund: Implications for the Evolving Architecture of Direct Access to Climate Finance. USAID Regional Development Mission for Asia: Bangkok, Thailand.